When only white will do, make sure it’s our super-duper double dimmer. This is certainly no ordinary white light switch. Crafted from steel and finished in a soft satin sheen, it really is a thing of beauty. And those gorgeous knurled knobs are simply the cherry on top. 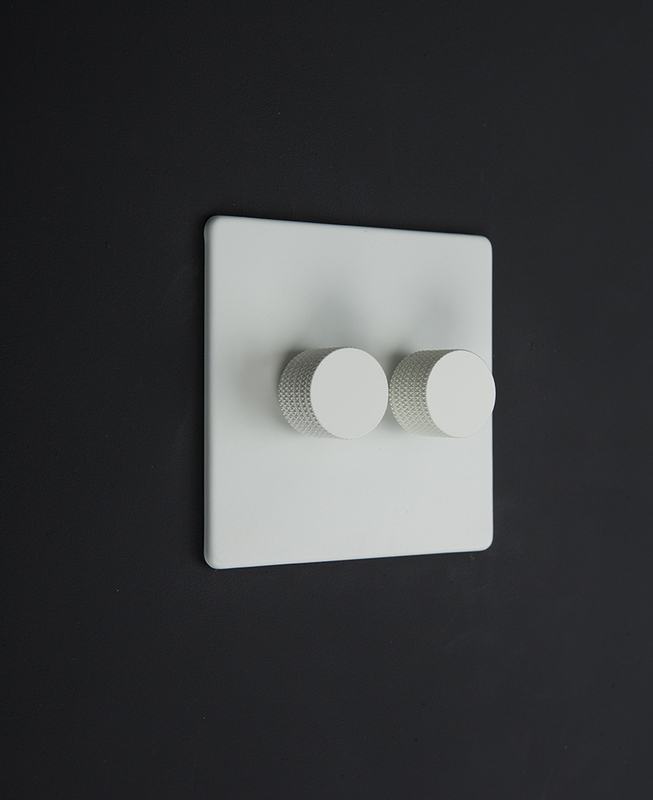 We’ve got a real soft spot for the classic white double dimmer switch. Its origins are firmly rooted in the old-school white switches, but the colour white is just about all that’s remained. It’s had such an incredible make-over, that it’s now the way cooler and almost unrecognisable cousin! Gone is the plastic, now replaced with gorgeous satin sheen coated steel. 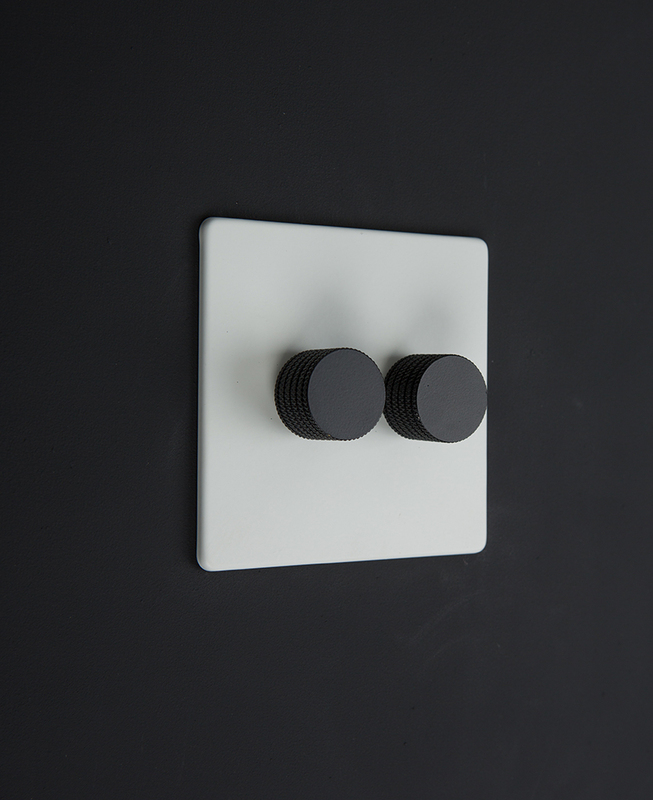 Gone are the boring matching plastic knobs, now replaced with stunning contrasting knurled edge knobs. Needless to say, this modern-day version of the white double dimmer switch is a design classic, and at the top of all our wishlists. If you’re a lover of simple pared-back interiors, then this is the dimmer for you. Choose from any one of the four knobs available – we’ve tried them all and they all look stunning. Apologies for creating a knob conundrum! The very fact that you’re here on this page means you probably know what an amazing difference having dimmable lights has on the ambience of a room; it’s an absolute game-changer. If you’re thinking of replacing other dimmer switches then have a look at the rest of our white switches and sockets range. And if all the light switch jargon has frazzled your brain, have a quick read of our guide light switches explained. 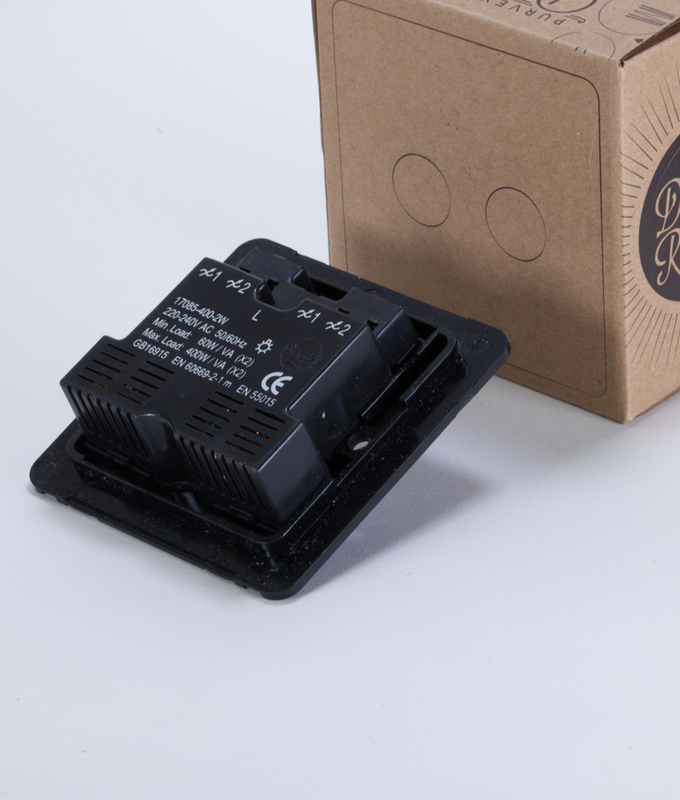 It’ll clarify the difference between 1, 2 & 3 gang as well as when to use 1 way, 2 way and intermediate switches.